Grovemont Park Performance Pavilion Nears Completion! Grovemont Park Performance Pavilion nears completion. The new permanent performance pavilion in Grovemont Park, Swannanoa, NC, is almost complete. The space will be complete in time for the Groovin' 2018 summer concert series. The pavilion provides a covered stage for community concerts and other events including the 16-year tradition of Groovin’ on Grovemont concert series, Cinema on the Square (outdoor movie night), as well as educational and entertainment programming for the families and children of the Swannanoa Valley. Funding for the pavilion has come from members of the community, and grants from Buncombe County Parks & Recreation, and the Black Mountain-Swannanoa Valley Endowment Fund, as well as generous support and contributions from the Friends of the Swannanoa Library, Friends and Neighbors of Swannanoa (FANS) and the Swannanoa Community Council itself. The final budget for the new performance space ended up being approximately $30,000. Additional funding is being requested and encouraged from individuals, families, businesses, and other organizations in the Swannanoa Valley. Tax-deductible donations can be made by credit/debit card through the GrovemontPark.org website, or by mailing checks to: Swannanoa Community Council, P.O. Box 1008, Swannanoa, NC. The Swannanoa Community Council's mission includes serving the residents of Swannanoa, the Swannanoa Valley, and the larger community. The Swannanoa Community Council owns and manages properties in the Grovemont Community of Swannanoa including the building that houses the Swannanoa Library, Grovemont Park & Playground, and the Historic Grovemont Square green space. New Performance Pavilion Coming to Grovemont Park - Spring 2018! WHAT: A permanent performance pavilion to be constructed in Grovemont Park, Swannanoa, NC, to provide a covered stage for community concerts and other events including the 15-year tradition of Groovin’ on Grovemont concert series, Cinema on the Square (outdoor movie night), as well as educational and entertainment programming for the families and children of the Swannanoa Valley. WHEN: Fundraising is ongoing now. Pavilion construction should be completed by May, 2018, in time for the annual summer Groovin’ on Grovemont concert series. 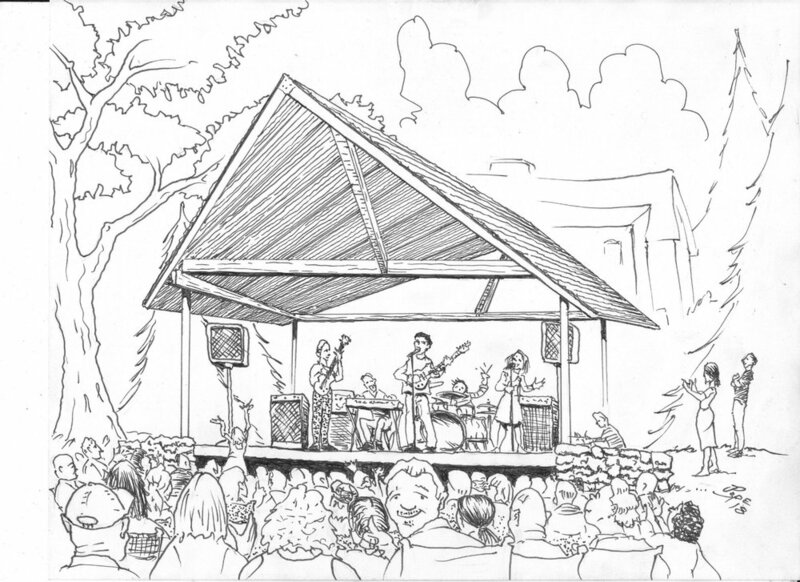 Artist Jerry Pope (Hare Brand Ideas) conception of the new Grovemont Park Performance Pavilion. DETAILS: The Swannanoa Community Council (SCC), a non-profit organization operating in Swannanoa for over half a century, has received a $6,000 grant from Buncombe County Park & Recreation to assist in the construction of a covered outdoor performance space adjacent to the Swannanoa Library in the Grovemont neighborhood in Swannanoa, NC. The total budget for the new performance space is approximately $14,000. The Swannanoa Community Council is managing the project as well as contributing financially to the effort. Two other Swannanoa-based non-profits, Friends of the Swannanoa Library and Friends and Neighbors of Swannanoa have also pledged their support. Additional funding is being requested and encouraged from individuals, families, businesses, and other organizations in the Swannanoa Valley. Tax-deductible donations can be made by credit/debit card through the GrovemontPark.org website, or by mailing checks to: Swannanoa Community Council, P.O. Box 1008, Swannanoa, NC. The performance pavilion will provide a permanent stage and structure for community events, including the annual Groovin’ on Grovemont concert series, a 15 year tradition. The popular concert series takes place in July and August each year and historically has hosted live music performers under a temporary tent, on an aging wooden platform in Grovemont Park. The new performance pavilion will feature an accessible 15’ X 24’ covered stage. The pavilion is designed to be an aesthetically-pleasing structure that will blend into yet enhance the existing park, featuring river-rock masonry that matches the historic rock wall that borders the Grovemont Park green space. The architectural design for the structure has been provided by SCC board member, retired architect/professor, and long-time community service volunteer, Bill Bauman. 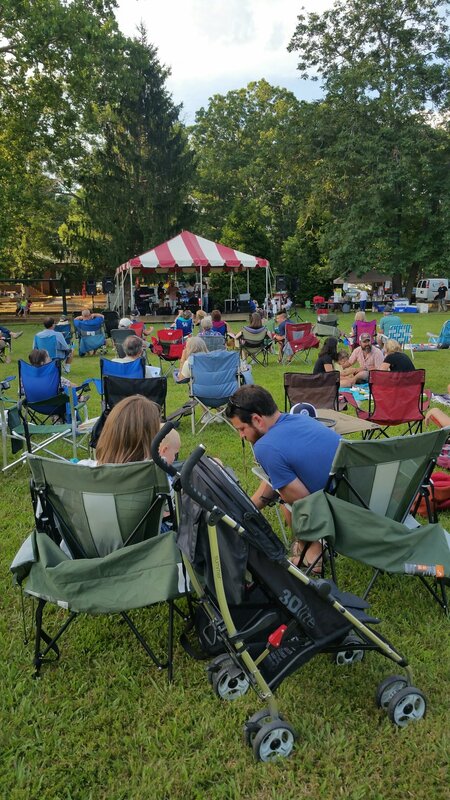 The 15th annual Groovin’ on Grovemont summer concert series returns to Grovemont Square (adjacent to the Swannanoa Library) on July 11, July 25 and August 8, at 6:00 p.m.
Bring a blanket or lawn chair and come enjoy these family-friendly evenings of great music, brought to you entirely by local sponsors and community volunteers! The concert series is free and open to the public. Concessions, including pizza, hot dogs and home-baked goods, are available for purchase. Proceeds benefit the Friends of the Swannanoa Library and the Swannanoa Community Council. July 11: LYRIC – With an enlightened mixture of pop, soul and funk, LYRIC awakens an undiscovered spirit within their audiences, and consistently delights crowds across the region. Led by the poetic and soulful voice of lyricist and lead singer Leeda Jones, this group of multi-talented musicians has been described by many as the best band in Asheville. August 8: The Paper Crowns – The Paper Crowns are the multi-instrument, genre-crossing power-duo of Spiro and Nicole Nicolopoulos. Earning their reputation as the genuine article and as a band on the cutting edge of modern roots music, the Paper Crowns have a musical chemistry that is a gumbo of Appalachian folk and bluegrass, Dixieland melodies, delta blues, acid rock, murder ballads, outlaw country and Southern Gospel that they cook up into a sound all their own. The Playground & Park upfit is almost complete! These next two work days will be used to complete the distribution of the remaining mulch, and do some patch construction (with granite screenings) in and around the playground. The dates are May 11(Thur) --- 9:30-3:00. Keep in mind that even if you can only come by a 1/2 hour or so, every bit helps! Come on out and lend a hand! Terrific progress continues on the playground and park! Next work/fun day is scheduled for this Saturday, 4/1 9:30-3:00 to finish spreading the last of the playground mulch, and constructing/spreading granite screenings for the path through the playground. Come on out and lend a hand! We are excited to report that the hard work over the past month has started to pay off, and the Grovemont Park Playground is now re-opened! That said, the work isn't quite complete. Several more work sessions are needed to completely re-mulch the playground (another truck-load of mulch will be delivered on 3/27), and additional work is needed with timbers and path making/maintaining. The next workday is scheduled for Saturday, 3/25. More work days will be happening the week of 3/27 too! Grovemont Park Needs Your Help This Week! Sign Up To Help Now! Volunteers needed March 1st through 11th, 2017 -- click button above to get involved! The playground at Grovemont Park, adjacent to the Swannanoa Library, was constructed in 2000 through a major fundraising and volunteer labor effort involving scores of Swannanoa residents. The project was coordinated by two local non-profits, the Friends of the Swannanoa Library, and the Swannanoa Community Council. The playground and surrounding park have been enjoyed by literally thousands of families in the community for the past 16+ years. But after all those years of service, the playground is showing its age and is in need of an overhaul. An effort to completely replace the protective mulch and make other repairs and improvements is in the planning stages. A generous grant from Buncombe County Parks & Recreation will help with some of the expenses, but more funding, materials, planning, and labor are needed. The bulk of the community workdays will occur in early March (see the Volunteer section of the GrovemontPark.org website for details), and will require lots of volunteer labor for removing and spreading mulch, construction of timber planting beds, building and restoring walking paths, graffiti removal, and much more. Additional funding and in-kind donations are also needed, along with ready-to-eat food for hungry volunteers. If you're interested in volunteering time, or making an in-kind contribution of materials, food, etc., please check out the Volunteer or Contact sections of this website. Please consider making a contribution on our Donation page. Thank you for your support in restoring this community gem! Members of Black Mountain-based Boy Scouts Troop 42 have been involved in helping to plan the Grovemont Park playground over past few months. On February 18, 2017, members of the troop came out, rolled up their sleeves, and helped Swannanoa Community Council and Friends of the Library leaders start the work! Thank you Scouts...you are an amazing asset to our community!